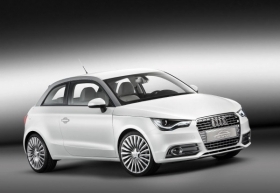 The Audi A1 E-tron has a small gasoline engine that recharges its lithium ion battery, extending the car's range to 250km. MUNICH -- Audi has denied a report that it plans to launch sales of an electric version of its new A1 with a range-extending rotary engine against the wishes of parent Volkswagen Group. The Financial Times Deutschland reported on Monday that VW's premium brand plans to go its own way on electric cars by developing for production an A1 powered by a lithium ion battery and a small gasoline combustion engine. Audi wants to sell a rotary engine EV to give it a stand-out competitor to BMW's Megacity Vehicle, the newspaper said. It added that VW Group wants its 10 brands, which include luxury carmakers Porsche and Bentley and the volume marques VW, Seat and Skoda, to have a common strategy for EVs to reduce costs. The newspaper said VW insiders at the company's Wolfsburg headquarters are calling Audi's stance "anarchic" but an Audi spokesman told Automotive News Europe: "There is no problem between VW and Audi." VW was not available for comment. Audi unveiled a rotary engine EV based on its A1 entry-premium car at the 2010 Geneva auto show, calling it "a near-series production vehicle." The car has a lithium ion battery mounted in front of the rear axle that drives the wheels and a single-rotor gasoline engine that Audi calls a "Wankel" unit. The engine recharges the battery when its energy is depleted and extends the car's range to 250km from 50km for its full-electric, battery-only concepts. Audi plans to field test the concept on the streets in Munich, Germany, by mid-2011. The Audi spokesman said the field tests will help to determine whether the A1 E-tron goes into production. The A1 E-tron is Audi's third electric car concept. The brand unveiled larger E-tron cars, powered only by batteries, at the 2010 Detroit auto show and at the 2009 Frankfurt show. Audi plans to launch an E-tron sports car in 2012 and expects 5 percent of its sales to be electric models by 2020.